Shining Crane Machine is a LED colour series of prize redemption machines in which players must try to pick up prizes using the claw mechanism to win! The Shining Crane comes in several colours, including Yellow, Blue, Light Blue, Pink, Orange, and Green. It has a special bright and attractive design using LED lilghts to stand out in any location. Players simply use the joystick to move the claw into position above the desired prize, and when ready, players hit the button to lock the claw in place and drop it to pick up the prize. 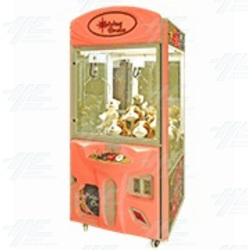 The cabinet is made with a reliable heavy duty metal structure for durability, and is suitable for 4-12 inch plush toys, allowing for a wide range of prizes to be included in the machine. The cabinet is also linkable and is a great new attraction for Family Entertainment Centers. The Shining Crane comes in several colours, including Yellow, Blue, Light Blue, Pink, Orange, and Green. It has a special bright and attractive design using LED lilghts to stand out in any location. Players simply use the joystick to move the claw into position above the desired prize, and when ready, players hit the button to lock the claw in place and drop it to pick up the prize. The cabinet is made with a reliable heavy duty metal structure for durability, and is suitable for 4-12 inch plush toys, allowing for a wide range of prizes to be included in the machine. The cabinet is also linkable and is a great new attraction for Family Entertainment Centers.